Mang Inasal is giving all unli-rice lovers a special Early Dinner Treat as part of the brand’s 15th anniversary celebration. Aside from their famous Chicken Inasal, Unli Rice is one of the reasons why Mang Inasal is a hit among chicken aficionados. 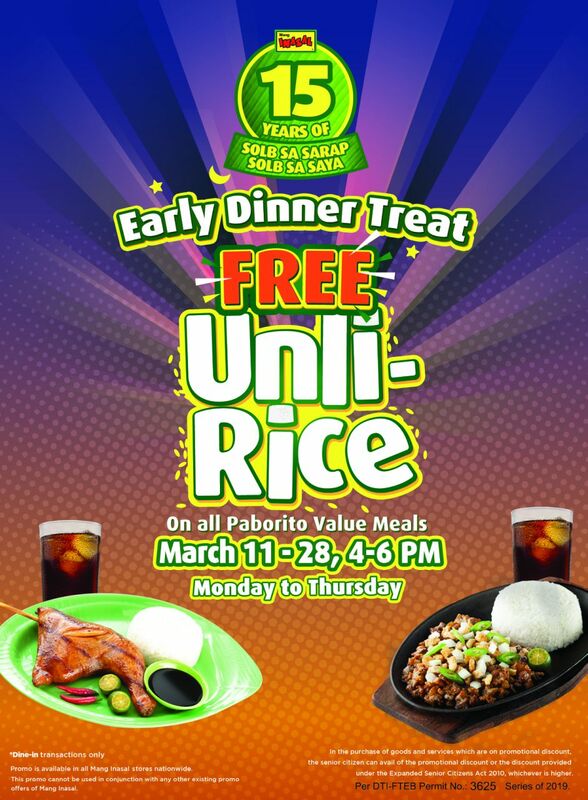 Now you can also get free unlimited rice servings on all Paborito Value Meals from March 11 to March 28, Mondays thru Thursdays, from 4 to 6 pm only. The Early Dinner Treat promo is available at all Mang Inasal stores nationwide and valid for dine-in transactions only. 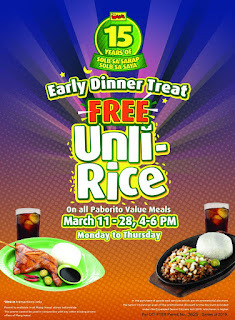 Celebrate Mang Inasal’s 15th anniversary by enjoying their unli rice promo with Paborito Value Meals. So go ahead and visit any of Mang Inasal's 500 stores nationwide for your Solb sa Sarap, Solb sa Saya Early Dinner Treat with free unli-rice!